Fukushima: How To Avoid A Potential Chernobyl? The world media likes to focus on the potential of a nuclear meltdown at Fukushima's multiple reactors, including melted cores, exposed uranium and plutonium etc. In fact, the old fuel rods are much more dangerous than the nuclear meltdown scenarios because there is more radiation in the unguarded spent fuel pools than in the reactors themselves. The Japanese nuclear crisis has the potential to be larger than Chernobyl because there are several tons of nuclear waste stored in the reactor cores that could be lofted into the environment in the event of explosion. Cracks are already there in the containment vessels of reactors one, two and three. If those cracks grow, or if there is an explosion, this could be something beyond Chernobyl, because of the various fission products being released into the environment. Spent fuel rod fires could pour enough radioactive waste into the atmosphere to cause what nuclear engineers are now calling "Chernobyl on steroids." Here lies the potential for a catastrophe larger than Chernobyl unless the Japanese and US governments use their air force and military power to entomb the reactors in concrete, sand and boric acid as soon as possible, just at the Russians did in 1986. As things stand, a Chernobyl-style release of nuclear material into the global land-sea-air interconnected environment continues to remain a significant risk, which ought to be addressed as soon as possible. Given the geographic position of Japan, such a catastrophe would inevitably have consequences for a number of countries framing the Pacific rim; and due to atmospheric and oceanic currents, many countries around the world. Although the Japanese have now classified their nuclear crisis at Level 5 -- the same as Three Mile Island in 1979 -- it is for the reasons of the spent fuel pools etc that French officials were the first to categorise the Japanese nuclear crisis at Level 6, with Level 7 being the highest. Level 7 was Chernobyl: uncontrolled release of fission products in 1986. Although Fukushima is not at Level 7 yet, there are more diverse cores -- uranium, plutonium, MOX -- and more radiation sitting there, than was the case at Chernobyl. The best case scenario is if there is no massive release of fission products because somehow the containment vessels hold. 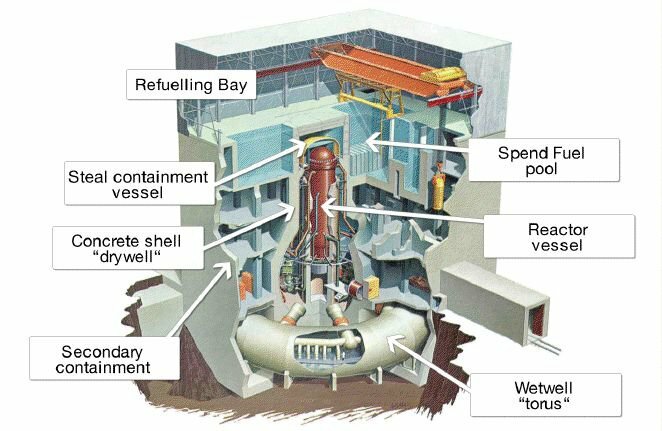 If there is a meltdown in the reactors, but the structurally compromised containment vessels hold, then we are in a stable situation albeit momentarily. Yet, we now have cracks in several containment vessels and it is not certain how stable those vessels are likely to remain over time. The crisis is close to the point of no return due to excessive levels of radiation zapping rescue workers on site. The radiation levels are near lethal right now. At a certain point the workers will be left with no choice but to abandon ship. It will be an untenably short suicide mission to remain there given the hourly exposure rate that could come to pass. Once the workers abandon ship it is inevitable there will be meltdowns in all three of the reactors, and also the storage tanks with old fuel rods could catch fire, as containment is lost. Japanese engineers working in and near the reactors are having difficulty keeping the reactor cores cooled and spent fuel rods covered with water. If they fail in that effort, large amounts of radiation would be released, creating a contamination cloud that could affect millions of people in the Tokyo metropolitan area, across Japan and elsewhere. 1. Admiral Willard is in regular contact with Japan's top military officer, General Ryoichi Oriki. 2. The US commander in Japan is sharing headquarters with the Japanese disaster relief commander. 3. A US Army ground commander has created a “joint task force” with leaders of the Japanese Self-Defense Force, as the Japanese military is known. 4. The US military is sending manned and unmanned aircraft into the area around the nuclear plant to take photographs and test for radiation levels. 5. Remotely controlled aircraft are continuously flying close to the reactors to gather data without endangering any pilots. 6. The US military is sending its troops into the danger zone near the Japan's crippled nuclear power plants as needed. 7. A small team is working with Japanese officials to assess the danger in areas near the reactors. 8. If necessary, the US military will send more troops to help prevent a meltdown of the reactors' fuel and the release of large amounts of harmful radiation. 9. An undisclosed number of US military personnel have taken potassium iodide pills to help prevent radiation damage to the thyroid gland while they carry out critical operations. 10. Some US troops on the ground are wearing personnel radiation detectors on their uniforms. 11. 15 ships and thousands of naval, ground and air force personnel are working to help Japan deal with the damaged nuclear reactors and the humanitarian crisis caused by the earthquake and tsunami. 12. 450 more US experts in radiological contamination are on alert to be deployed to Japan if needed. 13. All US aircraft and ships in the area have sensors on them, and any data on radiological contamination is immediately shared with the US and Japanese governments. 14. American and Japanese militaries are well prepared to work together in such a critical situation after decades of close relations and joint exercises. Admiral Willard, chief of the US Pacific Command, acknowledges that the triple disasters -- the earthquake, tsunami and nuclear meltdown threat -- go beyond anything the two militaries have ever practiced dealing with. He says the reports he has received indicate the team at the reactors has had more success recently and he is "cautiously optimistic" a full meltdown of the nuclear fuel will be avoided. He indicated he will send more forces into the most dangerous area near the reactors to help if necessary. The Japan-US "joint task force" may have to take over at some point and bury the Fukushima reactors in concrete, just like the Russians did at Chernobyl, sandbagging the reactor with 5,000 tons of concrete, boric acid and sand. The US military is preparing to ramp up its involvement -- if needed -- to halt the flow of deadly radiation from the damaged nuclear plant. According to the US Navy, military operations are presently focused on humanitarian assistance, but American forces stand ready to respond more directly to the nuclear plant disaster if Japanese authorities appear unable to cover the nuclear cores themselves.